Josephine Langford was born in Perth, Australia and raised in the Perth suburb of Applecross. Her parents, Stephen and Elizabeth Langford, are both doctors. Her older sister Katherine Langford is also an actress, who made her breakthrough in the Netflix series 13 Reasons Why. Josephine studied from age five to 13 at the Ali Roberts Studio in Leederville. Josephine made her screen debut in the indie film Pulse (2017), which screened at film festivals. Her American film debut came the same year with the horror film Wish Upon (2017), starring Joey King. She also played a recurring role in two episodes of the Australian TV series Wolf Creek. When the original actress cast as Tessa in the Hollywood production After (2019) dropped out, Josephine replaced her. 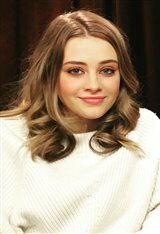 She co-stars alongside Hero Fiennes Tiffin (Ralph and Joseph Fiennes' nephew). After is based on a book series for young adults, which started out as fan fiction based on author Anna Todd's view of singer Harry Styles. Josephine is now based in the States.